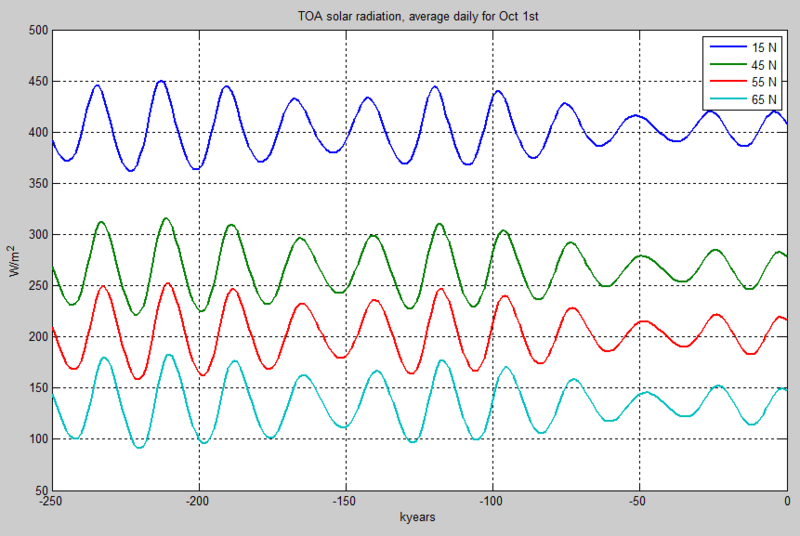 In Part Three we had a very brief look at the orbital factors that affect solar insolation. Here we will look at these factors in more detail. We start with the current situation. The earth is tilted on its axis (relative to the plane of orbit) so that in July the north pole “faces” the sun, while in January the south pole “faces” the sun. We can see that the southern hemisphere has a higher peak value – this is because the earth is closest to the sun (perihelion) on January 3rd, during the southern hemisphere summer. This is also reflected in the global value which varies between 330 W/m² at aphelion (furthest away from the sun) to 352 W/m² at perihelion. There is a good introduction to planetary orbits in Wikipedia. I was saved from the tedium of having to work out how to implement an elliptical orbit vs time by the Matlab code kindly supplied by Jonathan Levine. He also supplied the solution to the much more difficult problem of insolation vs latitude at any day in the Quaternary period, which we will look at later. The earth’s orbit currently has an eccentricity of 0.0167. 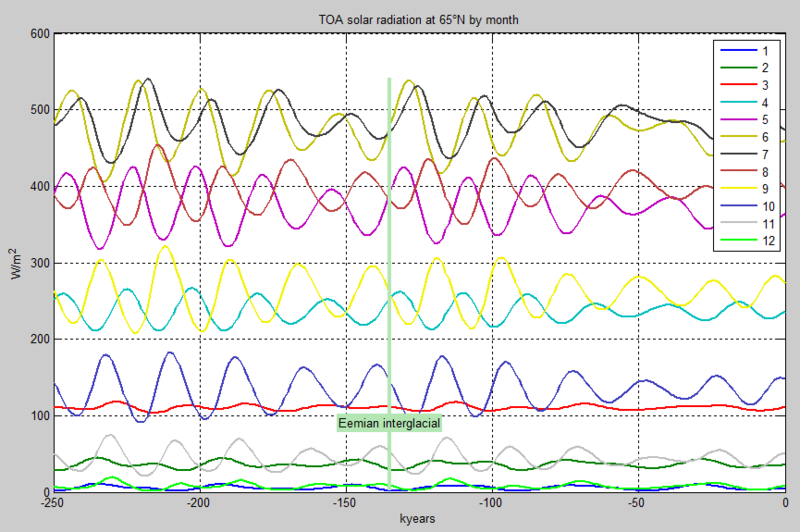 This means that the maximum variation in solar radiation is 6.9%. Perihelion is 147.1 million km, while aphelion is 152.1 million km. 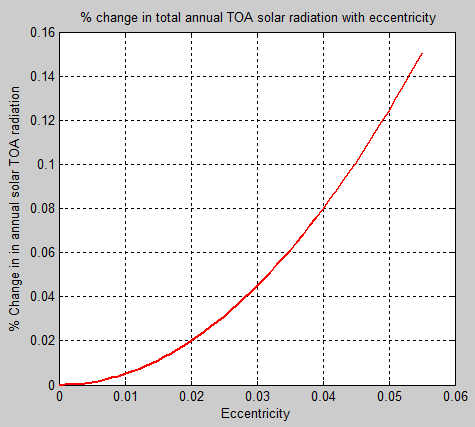 The amount of solar radiation we receive is “the inverse square law”, which means if you move twice as far away, the solar radiation reduces by a factor of four. So to calculate the difference between the min and max you simply calculate: (152.1/147.1)² = 1.069 or a change of 6.9%. Over the past million or more years the earth’s orbit has changed its eccentricity, from a low close to zero, to a maximum of about 0.055. The period of each cycle is about 100,000 years. It’s a staggering drop, and no wonder the strong 100,000 year cycle in climate history matching the Milankovitch eccentricity cycles is such a difficult theory to put together. To understand those basics of these changes take a look at the Milankovitch article. 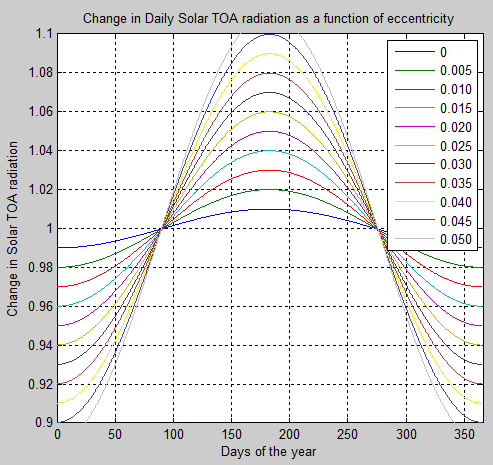 Neither of these two effects, precession and obliquity, changes the total annual TOA incident solar radiation. They just change its distribution. 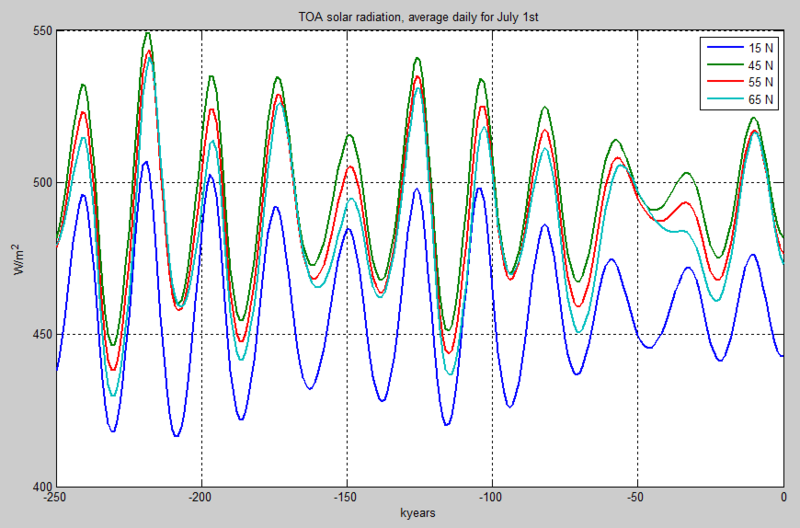 Notice that the equatorial insolation is of course lower than the mid-summer polar insolation. And just for interest I marked one date for the last inter-glacial – the Eemian inter-glacial as it is known. Then pick from the graph and let’s start cooking.. Having trouble? Pick a different latitude. Southern Hemisphere – no problem, also welcome. As we will see, there are a lot of theories, all of which call themselves “Milankovitch” but each one is apparently incompatible with other similarly-named “Milankovitch” theories. At least we have a tool, kindly supplied by Jonathan Levine, which allows us to compute any value. So if any readers have an output request, just ask. ..The marine isotope record is commonly tuned to astronomic chronology, represented by June insolation at the top of the atmosphere at 60′ or 65′ north latitude. This was deemed justified because the frequency of the Pleistocene gross global climate states matches the frequency of orbital variations.. 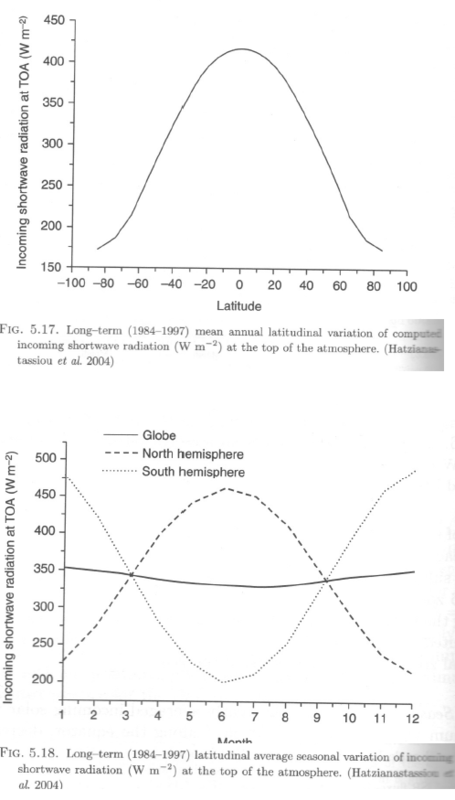 ..The mechanism of the climate response to insolation remains unclear and the role of insolation in the high latitudes as opposed to that in the low latitudes is still debated.. ..In either case, the link between global climates and orbital variations appears to be complicated and not directly controlled by June insolation at latitude 65’N. 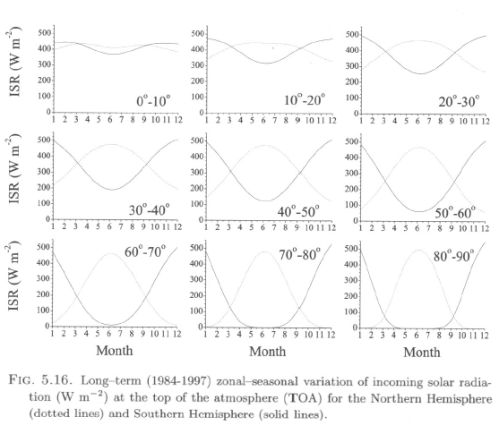 We strongly discourage dating local climate proxies by unsubstantiated links to astronomic variations..
I’m a novice with the historical records and how they have been constructed, but I understand that SPECMAP is tuned to a Milankovitch theory, i.e., the dates of peak glacials and peak inter-glacials are set by astronomical values. Are you planning on looking at Hurst-Kolmogorov processes? Koutsoyiannis seems to like those a lot. I read a few of his papers a while ago. Don’t know where this journey will take us.. Speaking of Jonathan Levine and orbital changes, have you seen his Planet movie? I didn’t know about it, but I had a look, very nice. Figure 3 – should the pale green line be labeled 0.55 instead of 0.055? Well spotted, actually the legend is wrong (it was hand-typed because I often struggle automating Matlab legends), it should read 0.005, 0.010, through to 0.055. I will fix it shortly… Done. Current summer 65N insolation is now at the same low levels as the last glacial maximum. Fortunate that we side stepped glaciation.